Sometimes we use words a lot, even to the point of perhaps overusing them. Sorry is a good example: it is perhaps something of a national characteristic – that we as British people apologise for everything just in case. This has led some people to the point of view that familiarity breeds contempt: that the more often we say sorry, the less we mean it, our words are empty and our society debased, rude and squalid. Whereas a more charitable interpretation sees something of love, care, concern, and humility in our apologising: it is a Christian thing to do, and what we say and do affects who and what we are as people, and the more we say or do something the greater its effects upon our lives and characters – the more it can form us and the people that we are. If we genuinely say sorry to God and each other and mean it, and amend our lives accordingly it can only be a good thing. When John the Baptist greets his cousin in this morning’s Gospel, the words he uses are both familiar and strange. We, as Christians are used to saying and hearing the phrase ‘the Lamb of God’. We are used to it at Mass, we are used to seeing it on the Signs of public houses called the Lamb and Flag, or as the badge of Preston North End Football Club. While the image is familiar, it is worth spending a few moments to consider exactly what John is saying about Jesus. The image of a lamb brings to mind a passage in the prophet Isaiah, in the Song of the Suffering Servant, who ‘like a lamb that is led to the slaughter, and like a sheep that before its shearers is dumb’ (Isa 53:7), a prophecy that will be fulfilled in Holy Week, on Good Friday. Yet here, just after the Baptism of Our Lord in the Jordan, when the Spirit descends at the beginning of Our Lord’s public ministry, before the first sign of turning water into wine at the marriage of Cana, we see in John’s description of Jesus a prophetic utterance which points forward to Jesus’ death on the Cross for the world. So then, from the very beginning, as with the gift of myrrh at Bethlehem, we see the culmination at Calvary, the beginning points to the end (and beyond). The other image of the lamb which comes to mind is that of the Passover lamb, by which the people of Israel are freed from slavery to journey to the Promised Land. Yet Jesus is the Passover Lamb who will free all of humanity from sin for all time. In being baptised by John the Baptist, Jesus was doing something which he did not need to do, he who was without sin did not need to be cleansed from sin, but in his baptism Jesus gives us an example, for us to follow. It is a sign of humility and obedience which we as Christians are to follow: it is how we are to shape our lives, in humble obedience to the example and teaching of Christ, it’s how to be a Christian. It is also how God gives us his Holy Spirit, as a gift which we receive and use with humility. 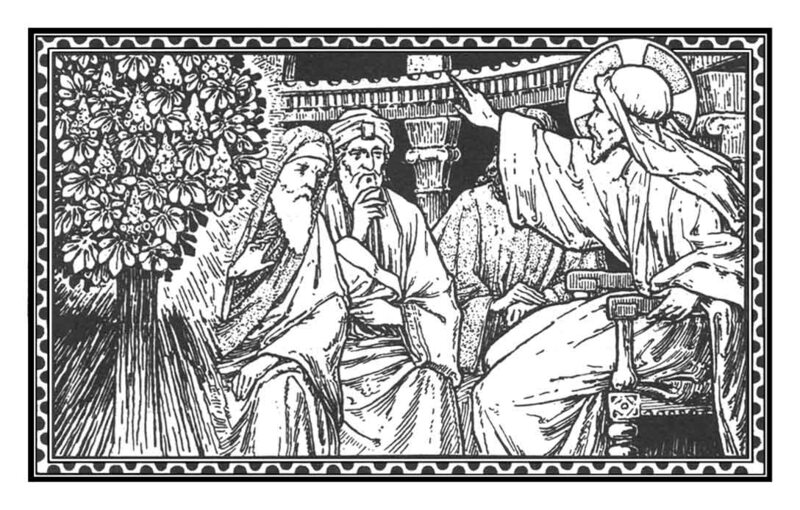 From the beginning of His public ministry, and even from the gifts offered by the Three Wise Men, Jesus’ life and mission is to be understood in terms of the death he will suffer. It is this sacrificial, self-giving love which God pours out on his World, which streams from our Saviour’s pierced side upon the cross. This is the wood, marked with blood which saves not only the people of Israel, but the entire world. This makes our peace with God, and our peace with one another. It is this recognition of who and what Jesus really is that is capable of showing us all who and what we really are. We can live our lives truly, wholly, and fully, loved by God and loving one another. That is why we are here today, in a church, at a celebration of Mass, so that the sacrifice of Calvary will be re-presented, made as real for us as it was on a hill outside Jerusalem nearly two thousand years ago. As we approach the altar, this is what we are to receive, the Body and Blood of Christ, the self same body and blood which were nailed to the Cross for our sins and the sins of the whole world. Our hands will hold and our lips will touch him who created the entire universe. How can we not fail to be shocked by the generosity of a God who gives himself to us in such a personal way, in a way that we do not deserve? Yet, we can never deserve such a gift, that is why God takes the initiative and gives himself to us, freely and gladly – like the Father of the Prodigal Son, God rushes to meet us, to embrace us and to celebrate with us, to show his love for us. God became a human being at Christmas so that we might become divine, through our baptism and our participation at the altar, the feast of the Lamb, so that we can become what God wants us to be – his people, sharing his body and blood, strengthened for the journey in body, mind, and spirit, to become what God wants us to be – united with him and one another. The Mass is the sacrament of unity, uniting heaven and earth through the sacrifice of Calvary, making all humanity to share the body and blood of Our Saviour Jesus Christ, feeding on him so that we may become what he is, to share eternity with him, and to live lives of faith and show this faith in our lives in everything we say, or think, or do, that the world may believe. Our faith must then have an effect upon our lives, which other people can see, it must make a difference, and it will, because of our faith and because God gives himself to strengthen us to be able to do this. So then, let us join the Wedding banquet of the Lamb and enter into the mystery of God’s self-giving love, nourished by Word and Sacrament, to grow in faith and love, and share it with others, so that they may believe and give glory to God the Father, God the Son, and God the Holy Spirit, to whom be ascribed as is most right and just, all might, majesty, glory dominion and power, now and forever. We live in a world which is obsessed by time. The pace of modern life is quite different to that of a generation or two ago. Despite the advent of labour-saving devices and technology we seem if anything busier than ever as other things come along to ﬁll our time – we can feel pressured, worried, and anxious. This isn’t good; we can’t help feeling that this isn’t how it is supposed to be. Thankfully God doesn’t work like this. The people of Israel have been waiting for a Messiah, for a Saviour to be born, who will save Israel from their sins, but it isn’t a case of birth on demand. As St Paul writes to the church in Galatia (Gal 4:4-5) ‘But when the fullness of time had come, God sent forth his Son, born of woman, born under the Law, to redeem those who were under the Law, so that we might receive adoption as sons.’ God’s time is not our time, and the Incarnation happens not at a convenient time, but in the fullness of time – after the message has been proclaimed by the prophets, who prepare the way for the Saviour; after Mary has said ‘yes’ to God, a ‘yes’ which can undo the ‘no’ of Adam and Eve. St John take us back to the beginning so that we can see what we are dealing with, and how it ﬁts into the bigger picture. What we are celebrating at Christmas is something which extends through time, both in its nature and its effects. It is why we as Christians make such a big deal of Christmas – it isn’t just something to do in the middle of winter, but along with Our Lord’s Passion, Death, and Resurrection , the most wonderful and important moment of history, which affects us here and now. What was made known to the shepherds we now proclaim to the world, what symbolically is shown in the Solemn Feast of the Epiphany, which we prepare to celebrate, where the Wise Men point to the manifestation of Christ’s Divinity to the whole world. IT may well surprise you to know that I have, on occasion, had recourse to the services of a turf accountant, I perhaps ought to explain the situation a little further. At the time I happened to have a friend whose Uncle was a world-famous Horse-Racing Trainer; he would, from time to time, mention a horse and a race and a date to me and I would pop down to the betting shop and put a few pounds on the horse to win, which it invariably did. It was, though without my parents’ knowledge or approval, a way of increasing my pocket money, which was welcome. Yet, due to the quality of the knowledge and information I had received, I was, unlike the rest of the people in the betting shop, not really taking much of a risk. Thankfully, God isn’t like this. The mystery of the Incarnation, of the Word made Flesh, which we celebrate tonight, tells us above else that God takes risks. In sending the Angel Gabriel to a young unmarried Jewish girl to tell her that she is going to bear God as a human baby, God is taking a risk. Mary could have said ‘No’ instead of which she says ‘Behold the handmaid of the Lord, be it unto me according to thy word.’ It is this ‘yes’ which undoes the ‘No’ of Adam and Eve to God; but there was no guarantee that God’s offer would be taken up. Mary risked being shunned by her ﬁancé and by society in general: as a woman bearing a child ‘conceived out of wedlock’. The Incarnation was a source of shame: it was a scandal which put Mary, her unborn child and the Holy Family beyond the pale, outside the conventions of polite society, it broke the rules. It was scandalous, risky, and beyond our expectation or understanding, but it worked. Likewise, the place where the King of all the Nations was born was not a palace, nor even a private house – people could not or would not give them a place for Mary to give birth to her son. Instead, in a stable, surrounded by animals, with no bed other than a feeding trough ﬁlled with straw, our salvation was wrought – though hardly the site one would expect. The ﬁrst people to whom the birth was announced were shepherds – people on the margins of society, ritually unclean – unable to worship in the Temple, beyond the pale. Yet, as the prophets had envisaged God as the shepherd of His people Israel, caring for them and guarding them, so these simple shepherds, ﬁlled with simple faith, obeying the message of the angel, went, as they were – tired and dirty to worship the Messiah, the Saviour of the world. They like Mary said ‘Yes’ to God – they came as they were and they worshipped. The kingdom of God, as instituted by the birth of Jesus Christ, welcomes the outcast, the sinner – it deﬁes our human expectation, it turns our world around. People had expected a Messiah from the family of David – it had been foretold by the prophets, Herod was afraid at the thought of being deposed, so afraid in fact that he arranged a mass murder in Bethlehem to try to safeguard his position. The zealous expected a great warrior leader to drive the Romans and Greeks out of Israel. But what God gives his world is something completely different – a weak, tender and vulnerable infant, who needs the love, care, and protection of a human family, to show us what love, simple faith and a trust in the intrinsic goodness of humanity can be. Rather than bringing war, the King of Peace was born, in Bethlehem, the House of Bread, a King who continues to feed us with his life-giving bread – his own Body and Blood, a scandal and yet a great gift, upon which we will feed this Christmas night. ‘And the Word was made ﬂesh and dwelt among us’ God, the Creator of the Universe, becomes a human being, so that we, all of us, might become divine – a profoundly strange and surprising turn of events. But just as the people of Israel had put a tent around the Ark of the Covenant and carried it around until the building of the Temple in Jerusalem, so now God would be with his pilgrim people on earth – sharing all of human life, from birth to death, so that we might, through him, share the Divine Life of Love, that of God the Holy Trinity: a relational God who invites humanity to share that relationship, who offers it freely, and to all. The sheer exuberance of such an offer, is almost proﬂigate: it is generous in a way which deﬁes our human expectation and our human understanding. Yet the person of Christ is a gift to the world, a gift which cuts through all our human conventions; a person who can be born, live and die and rise again and reign in a way which is scandalous – so scandalous in fact that people then and now prefer to deny the truth of God and cling to a neater human picture. Better to deny His divinity or His humanity than accept a mysterious reality.